Probability 0 may initially come across as the latest in the growing genre of death-obsessed 'endless run/descent' games but it started life as a mash-up of a shmup and a platformer, although its shmup origins appear to have been lost in its development. What remains is an endless, procedurally generated descent game. The game opens with an introductory level that familiarises you with various aspects of the game, basically moving, jumping, throwing stars and punching monsters. There's no avoiding the intro level and once its usefulness fades, i.e. after the first time you do it, you do wonder whether a shortcut key to skip past it wouldn't be helpful. Nonetheless it's useful, essential-even, to getting to grips quickly with the game, as once Probability 0 starts, it shows you no mercy. The good news is that while you will die often, it never feels like it's because the game is unfair in any way, which encourages you to keep trying again and again. There are a few game modes to choose from and although it does not make it clear at any point, they are judged on slightly different criteria. Beginner records your kill count, while Expert measures you on the depth you reach. By playing these two modes, you build up karma, which gives you access to a third mode, cleverly titled Karma, which scores you on the number of collected power-ups. It's up to you which measure of success you prefer. The bulk of the game is obvious enough. You must descend as deep as possible into a dungeon, leaping over or destroying blocks while avoiding or killing the various monsters that creep up out of the ether below. 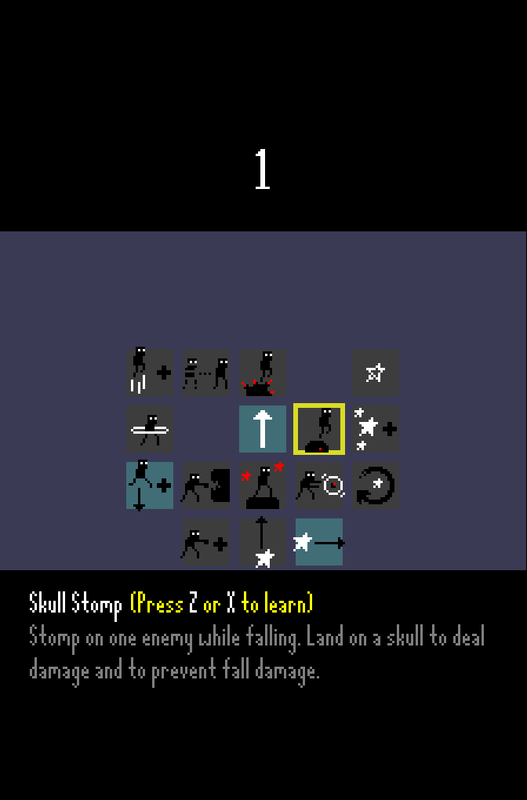 Killed monsters provide power-ups, giving you restored health or more stars. 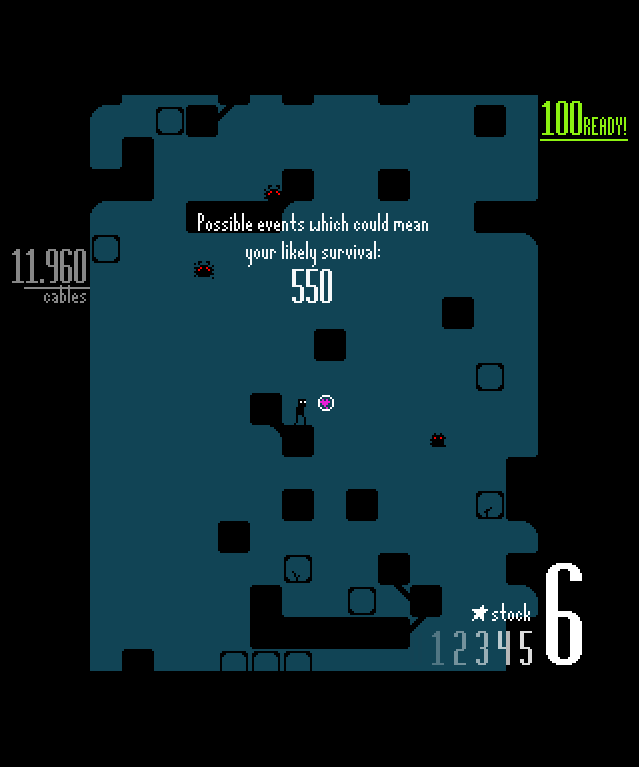 Collect a set amount of power-ups and you go up a level, although the descent itself is continuous. So far, so simple and these elements alone are enough to make it a stylish and enjoyable endless descent game. Graphically the game is of that modern style that knowingly apes a certain retro look that never quite existed. By that I mean a lot of retro-themed games masquerade as 8-bit or 16-bit style games while doing things that simply cannot be replicated on a retro system. This is not a criticism; rather it's more of a compliment that the video game industry has matured enough that like the music industry, it can hark back to old genres while forging ahead creating new styles. Aurally too, the game is simultaneously retro and modern, while the frenetic music is a real high point. Nonetheless there is a part of me that plays a game like this and wishes it could make an appearance on a genuine retro system. Given the growing prevalence of de-makes, including Paulko64's C64anabalt, maybe one day this will happen. In the meantime PC and Mac is just fine for Probability 0. It quickly becomes clear that the introductory level is inadequate in giving you a proper grounding in all of the various aspects of the game. It will probably take multiple plays before you make sense of what is going on around you. This is partly because of the pace at which the game is played, but mostly because it's simply not very clear. For instance, a plant with collectable stars on it exists in the introductory level, but without the stars, so at first it seems purely decorative until you actually touch one and pick them up. It also doesn't explain that your stars are limited in number - they're infinite in the introductory level - so again it can take a couple of goes to understand what is going on simply because you don't have the time to take stock of what is going on around you. It might sound daft, but it took me several turns to realise how the levelling system worked even though you only need to kill one monster to progress to level two. One of the more reliable methods of survival in an 'endless' game is often to avoid conflict altogether (I don't pretend this is glorious in any way) and it is not immediately obvious that the game wants to push you into constant conflict. Once you figure out the levelling system you're exposed to the key mechanic in Probability 0 that sets it apart from other 'endless' games like Mineshaft on the NES, or Downfall on the Atari Jaguar or Amiga, namely the levelling system and skill trees. 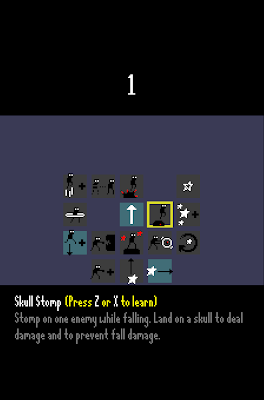 Using the skill tree you get the choice of a new ability at the end of every level, from being able to fall without injury to firing in new directions. 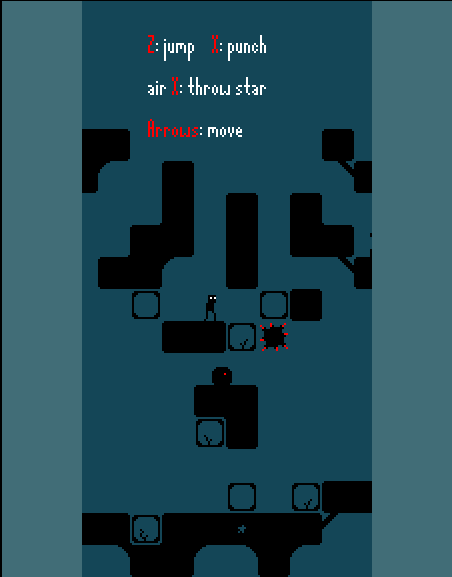 As you progress the powers become more fantastical and require more skill to master, such as teleportation. It is a simple yet crucial mechanic that allows even more replayability as you test out the various combinations available as you progress. By selecting certain skills you open up new ones later on, which encourages a surprising amount of variety given the quick and brutal nature of the game. 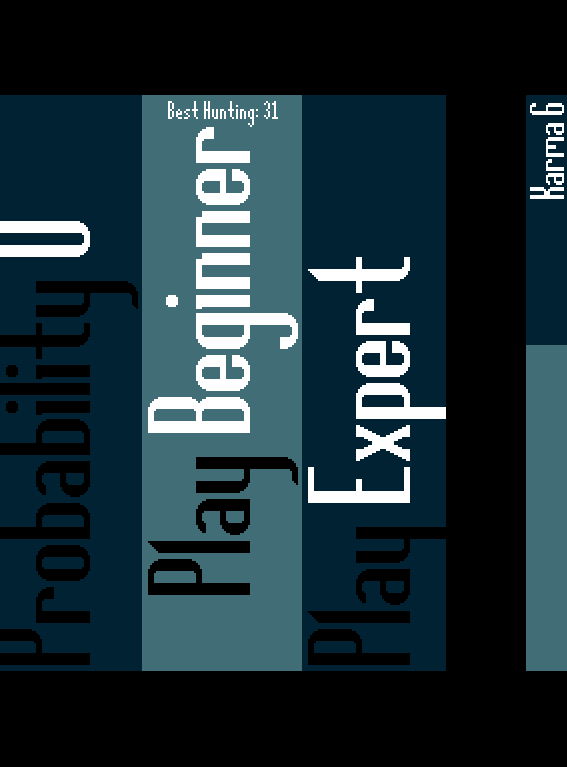 With the levelling and skill systems Probability 0 becomes a clever and addictive experience that encourages repeated goes as you try to beat your previous best with various skill combinations. That said it's by no means a perfect experience. Time and again you're left struggling to work out some of the nuances of the game and while none of it is a deal breaker by any means, it happens often enough that it becomes quite frustrating. These aspects probably wouldn't matter so much if the game wasn't so chock full of enjoyable touches that serve to raise it above the average 'endless-fall'/'procedurally generated levels' type of game even without the levelling system and skill trees. The presentation really is second to none, from the vertical menu style, the depth measurements that appear as you descend and the quasi-dial that displays the number of stars you hold, they are nice visual touches that add to the overall class of the game. The central feature however, on which the concept of the game hangs, is the probability counter displayed at the top of the screen. This shows you the probability of your survival and acts as a crude health bar that adjusts constantly depending on how much damage you've taken. It's a clever device to increase the tension as it drops inexorably towards zero as you take more and more damage. Given that it is the central feature of the game however, it does feel a little under-utilised, even the trailer for the game doesn't show it. The many witty ways in which it states the probability of your survival flick past so fast it's impossible to read and enjoy them. Instead you tend to just focus on the ever-changing number, which is a shame when so much effort has clearly gone in to coming up with amusing lines. Of course the counter argument is that by changing the text rapidly it creates the impression of speed and tension that permeates the rest of the game. It's a balancing act for sure and may in the end come down to personal preference. Nonetheless it does create a slight impression that beyond the inspiration for a clever title it hasn't been baked in to the game in the way perhaps it could have been. None of this stops the game providing hours of excellent entertainment, but sometimes falling just short of perfection can be more agonising that never coming close in the first place. So is Probability 0 worth the $9 asking price? Possibly, if the market were not already so congested with so many high quality games in a cheaper price range. Ultimately it has to compete against these titles and it wouldn't surprise me to see it fall in price in a few months, or perhaps end up as part of some sort of indie bundle, although the $12 bundle with three additional, previously unreleased games sweetens the deal considerably. You feel that if it sorts out the niggles, the product possibly of an author too close to the game to realise what it is like for someone coming in to it cold, then Probability 0 would be a near-flawless experience. As it stands it is merely 'excellent', though whether that makes it more or less probable (see what I did there?) that you'll take a punt on it is entirely down to you. Pre-order the game here (from the Probability 0 website). Sounds like a game well worth checking out. Thanks for covering it!